Kristee Ann Watson: Born and raised in North Vancouver, BC. I spent six months living in Kampala, Uganda working for Food for the Hungry. I continue to work for Food for the Hungry but now live in Bukavu, DRC. I find that working in Finance does not give me a lot to blog about. Sure I could tell you about the new spreadsheets I am working on or the Access Database that I am trying to create for Human Resources...but hey, who really wants to hear about that?!?!? However, since you sent me to "work" with Food for the Hungry, I guess I should keep you updated on what's going on in my "work" life. This increase in violence has forced us to shut down operations in South Kivu and suspending the contracts of our staff in these areas. This, however, affects our overall funding and means that we have less money to operate our main office in Bukavu. 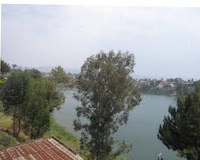 The result was that in June, we suspended the contracts of close to 15 Bukavu based staff. So what does it mean to suspend contracts? Well, we secured what is called a Force Majeur. It is a document issued by the Provincial authorities stating that due to unforseen reasons (WAR!) we can no longer continue safely operating in the South Kivu region. Under the Force Majeur, we can suspend the staff contracts for 2 months. If after those 2 months the situation has not improved we can then terminate the contracts. As you can probably imagine, this suspension of contracts did not go over so well with the staff in Bukavu (the staff in the fields completely understood the situation). Times are tough, and not getting a pay check really hurts. The problem is further exacerbated by the fact that all NGO's are unionized here in South Kivu and that there is a central Union as well. It has been very uncomfortable for those of us who are still working. The biggest problem is that the actual organized push against the FDLR has not started, so there is no chance the situation will have changed at the end of the 2 months. It is only 5 minutes away from our house. It is on the lake. There are lovely views of the lake from some of the offices...but not mine. Above is a pic of the view from the balconies.